The Big Buffalo Panel near the confluence of Cottonwood Canyon and Nine Mile Canyon. I visited this one shortly before the sun dropped down below the rim of the canyon walls above. 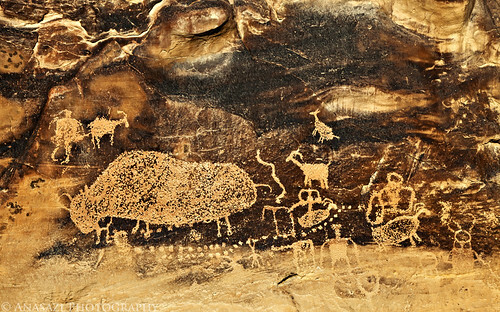 The bottom portion of this large panel is fading away with time, but the Big Buffalo and other figures higher off the ground remain and are still in good condition. There are many other unique and interesting panels in the area, including the well-known Great Hunt Panel.